Barrel saunas are highly sophisticated barrel-shaped sauna baths that are typically custom built or pre-cut for home construction. Typically made for outdoor use, barrel saunas incorporate excellent quality wood that adds a rich sense of elegance to your property and in order to endure harsh winter conditions. Unlike traditional, larger saunas, barrel saunas have curved walls that eliminate up to 23 percent of space, requiring less energy to heat and arguably more results. Also, the cylinder shape allows natural continuing air circulation because the air is pushed back on the round walls.There are several varieties of barrel saunas, including infrared, electric, and wood burning. If you’re looking for an outdoor sauna and a beautiful addition to your yard, barrel saunas may be the perfect choice for you. The origin of the barrel sauna is unknown, however speculation supports the notion that they may have been first built in Canada by crafty woodworkers. For the exception of the heating elements and the material used to secure the construction, barrel saunas are 100 percent made of wood and generally showcased as a gorgeous work of art that make great additions to residential properties. If the sound of installing a barrel sauna in your yard is enticing to you – you’re not alone. After the first wave of barrel saunas made its way into the marketplace, people everywhere began to buy these beautiful amenities like they were going out of style. For more information on basic price point and additional details of barrel saunas, please refer to the product listings below. This unit is large enough to accommodate multiple people but small enough that it won’t take up your entire yard. 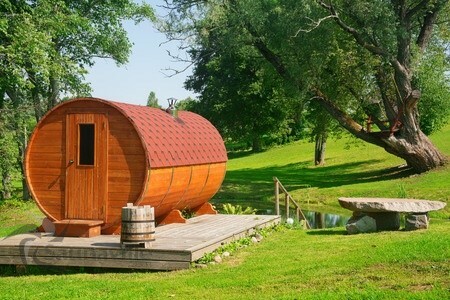 If you’re looking to add a barrel sauna to your property, this gorgeous piece of work is just right. This beautiful sauna can comfortably fit up to 6 people and offers a luxurious sauna bathing experience that simply cannot be duplicated. This stunning cedar sauna will instantly add sophistication and elegance to your property. With gorgeous craftsmanship and extreme durability, this unit is the perfect option to anyone that is looking for a top quality barrel sauna. Between exceptional craftsmanship, extreme durability, and a gorgeous finish, the Northern Lights Outdoor Cedar Barrel Sauna 8’ x 7’ has it all. This lovely amenity can fit 8 people comfortably and offers the finest features in the sauna industry.